From left: PWB 2013 Chair Linda Hebert, Amy Martino and Dottie Fawcett. 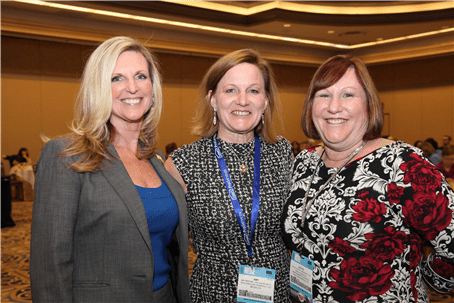 Amy Martino, principal and owner of Building Site Synergy LLC in Media, Pa., has been honored as the Member of the Year for the NAHB Professional Women in Building Council. A member of the Home Builders Association of Bucks & Montgomery Counties, Martino has been a force for education and the association’s charitable activities and was also instrumental in the formation of her association’s own Professional Women in Building chapter. Martino is a frequent presenter to national and regional forums including the NAHB International Builders’ Show and served as the Professional Women in Building Communications Chair for 2012 and 2013. A Penn State grad and Registered Architect in Pennsylvania, Maryland, New Jersey, Delaware and New York, Martino has built her career specifically focused on housing. “If you wanted someone with passion for the industry, tenacity, personality and a huge heart, that person would be Amy Martino,” says Dottie Fawcett, the HBA of Bucks/Montgomery’s Executive Vice President.